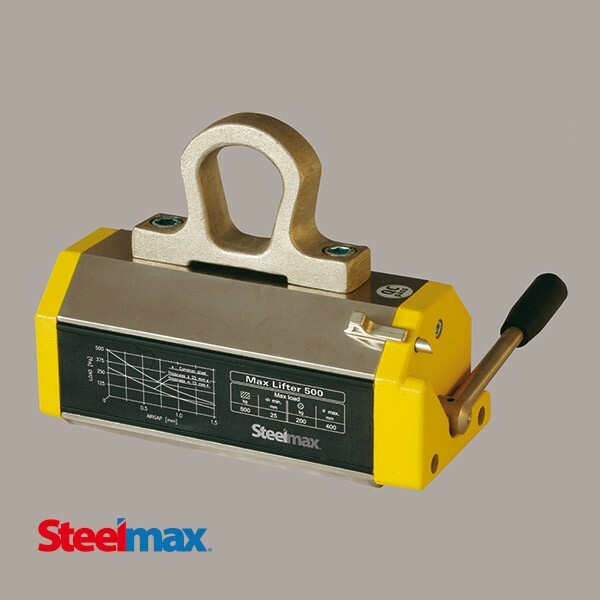 The Steelmax Max Lifter series of magnets are compact, self-contained lifting magnets that use permanent magnets to maintain holding power indefinitely. Because they require no electric power, they can be used where electric power is not readily available and free of the restriction of power cords. Max Lifter magnets are safe and efficient. The magnets lift, transport and release the load rapidly with the simple motion of a lever in a single operation. Once activated, a spring-loaded device blocks the engagement lever preventing any accidental deactivation. Each Max Lifter magnet is tested at three times the recommended load. Max Lifter magnets are robust and reliable. The rotor, the only moving part, has its fulcrum on ball bearings and doesn’t make any physical contact during rotation. All steel parts are nickel coated to prevent rust formation and improve component life. Max Lifter magnets will operate “maintenance free” over long periods of time.